Kamishibai, (kah-mee-she-bye) or “paper-theater,” is said to have started in Japan in the late 1920s, but it is part of a long tradition of picture storytelling, beginning as early as the 9 th or 10 th centuries when priests used illustrated scrolls combined with narration to convey Buddhist doctrine to lay audiences. Later, etoki (picture-tellers) adopted these methods to tell more secular stories. Throughout the Edo period (1603-1867) and on into the Meiji period (1868-1912), a variety of street performance styles evolved, using pictures and narration. The stages used for these early precursors of kamishibai were not as easily transportable as the form that developed in the late 1920s and came to be what we know as kamishibai today. The kamishibai performer made a living by selling candy, and he could strap the small wooden stage onto his bicycle with the illustrated cards and his wares and carry them easily from town to town. Typically, the stories were told in serial fashion and were so suspenseful that audiences came repeatedly to buy candy and to hear the next episode of the story. Kamishibai is, if anything, poor-man’s theater, and it flourished during a time when Japan experienced extreme financial hardship. In the 1930s, Japan suffered from an economic depression that sent many people onto the streets looking for a way to live from one day to the next, and kamishibai offered an opportunity for artists and storytellers to make a meager living. During and after World War II, kamishibai became an ever more integral part of the society as a form of entertainment that could be transported easily even into bomb-shelters and devastated neighborhoods. At this time, it was entertainment as much for adults as for children. 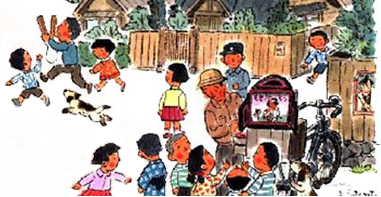 By the 1950s and the advent of television, kamishibai had become so popular that television was initially referred to as denki kamishibai, or “electric kamishibai.” But as Japan became increasingly affluent, kamishibai became associated with poverty and backwardness. Eventually kamishibai as a street-performance art all but disappeared. The artists who had made their living with kamishibai turned to more lucrative pursuits, notably the creation of manga (comic books) and later anime, but they never entirely forgot their roots in kamishibai. In fact, kamishibai is often seen as a precursor of manga, and its influence can still be felt in the distinguishing features of these later media. But kamishibai has never entirely died out. Kamishibai stories for educational purposes are still being published and can be found in schools and libraries throughout Japan and more recently, through the efforts of Kamishibai for Kids, in the United States and Canada. There are many people, too, who, like Allen Say, feel nostalgia for the old street-performances, and recreations of these can be found at various outdoor events and festivals. A particularly vibrant aspect of the kamishibai revival are the tezukuri kamishibai (hand-made kamishibai) festivals held at designated points throughout the year, where people young and old gather to perform kamishibai stories they have illustrated themselves. There are Japanese kamishibai artists who have taken their art form to other parts of Asia (Vietnam, Laos, Cambodia, Thailand), where people are learning to make and perform their own stories in their own languages. Kamishibai has become a way to bridge cultural and linguistic barriers. Wherever there are people who want to gather and share stories, kamishibai will always have a place.